Coach Drew to hold sessions Sept and Oct. Updated Tuesday October 23, 2018 by KBA Board. We are pleased to announce that KBA will be offering skills training for any girl (2nd-6th grade) within the Kings School District this fall. These trainings will be on Wednesdays and Thursdays at South Lebanon Elementary starting the first week of September and running through mid October. The girls will be split into two different training groups by their ages (2nd-3rd grade) and (4th-6th grade). 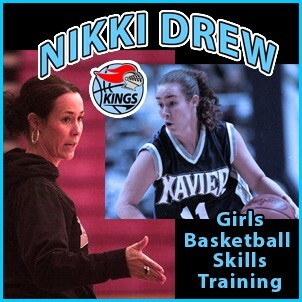 These trainings will be run by long time coach and trainer, Nikki Drew, with the help of several KBA coaches as well. Each session will cost $10 and payments will be taken at the door at the time of each training. These trainings are for all skill levels and anyone is welcome to join. We will cut at a max of 20 for each training session due to the size of the gym and to make sure the kids can be effectively trained. Hopefully, your daughter can join us for a few of these. We feel this will be a great way for the girls in our program to be prepared for the upcoming season.